NEW YORK (May 19, 2015) – Cale Conley and Iraq and Afghanistan Veterans of America (IAVA) are proud to reveal a new paint scheme on the No. 14 IAVA Toyota Camry for Memorial Day weekend at Charlotte Motor Speedway. IAVA, the leading post-9/11 veteran empowerment organization (VEO) with the most diverse and rapidly growing membership in America, began their annual #GoSilent campaign this month with the purpose of bringing the real meaning back to Memorial Day. As most Americans are spending Monday, May 25th at barbeques, at the beach, or seeking out the best holiday sales, IAVA is encouraging everyone to take one moment out of their day to #GoSilent in honor of our nation’s fallen. The hope is that every American will pledge to stop what they’re doing at 12:01pm ET and join IAVA for a national moment of silence to honor those who made the ultimate sacrifice. The time coincides with IAVA’s wreath laying before the Tomb of the Unknown Soldier at Arlington National Cemetery. Pledges to #GoSilent can be made at www.iava.org/go-silent. Conley and IAVA are bringing further awareness to the campaign by revealing the No. 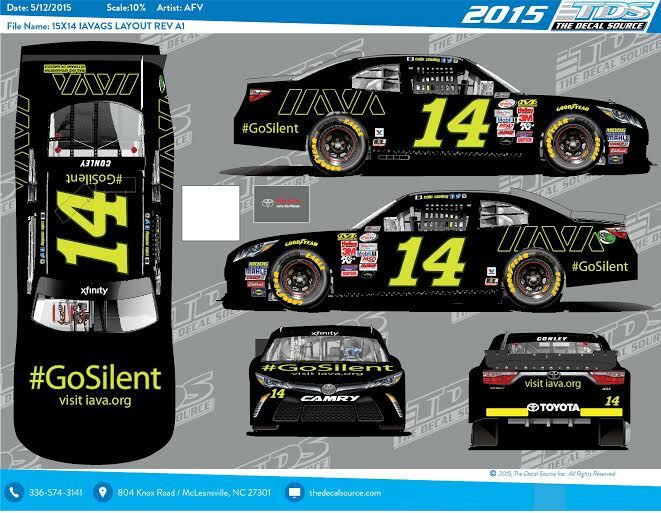 14 #GoSilent Toyota Camry this weekend for the Hisense 300 at Charlotte Motor Speedway. Conley will host a veteran meet-up at the track as way to thank members of the veteran community for their service. “To veterans, Memorial Day is one of the most important and moving days for our community every year. We’ve all lost friends, and we want to be sure they’re not forgotten. IAVA is once again setting out to remind America what Memorial Day is all about. That’s why we are proud to join Cale Conley in encouraging everyone to take just one minute out of their Memorial Day to #GoSilent. Cale has proven to be a true supporter of the veterans community, and IAVA is honored that he has donated space on his No. 14 Camry to help honor the fallen,” said IAVA CEO and Founder Paul Rieckhoff. Conley expanded his relationship with IAVA beginning at the Las Vegas Motor Speedway by running their green and yellow indefinitely throughout the season. He is especially excited for the opportunity to educate fans further on IAVA’s missions throughout the season. Be sure to tune into the Hisense 300 on FOX, PRN and SIRIUS XM Channel 90 on Saturday, May 23rd at 2:30PM ET and pledge your time on Memorial Day at IAVA.org/Go-Silent.